If you are new to our Employee Life Cycle series, click  here to go back and begin at Step 8 Measure, or read on for Step 9 Exit. Generally, when organisations are discussing the employee life cycle the primary focus is towards the steps of employee on-boarding and engagement. Unfortunately, limited attention is given to the processes needed to successfully exit an employee out of an organisation. According to Aberdeen research, only 29% of organisations have a formal exiting process to transition employees out of an organisation. Although it may seem counter-productive to focus on employees exiting a company, exiting can have a dramatic impact on organisational growth and performance. Without clear processes to document key events, organisations risk finding themselves unable to dispute unfair dismissal claims. A structured process is vital to ensure the exit process is legally compliant for every exiting employee. Whether the employee is leaving voluntarily or not, exiting is a delicate and important process and can be an uncomfortable experience for the employee and HR. If the termination process is not undertaken correctly, the organisation could potentially be exposed to a variety of claims, including unfair dismissal, discrimination, workers’ compensation claims for psychological injury, claims of bullying and/or harassment. Interestingly, 70% of organisations focus solely on managing the exiting process of voluntary separations. Involuntary separations and retirees cannot be neglected, as they are still a security and compliance risk. Each type of exit needs its own standard process to meet the exiting requirements of the organisation and the entitlements of the employee. 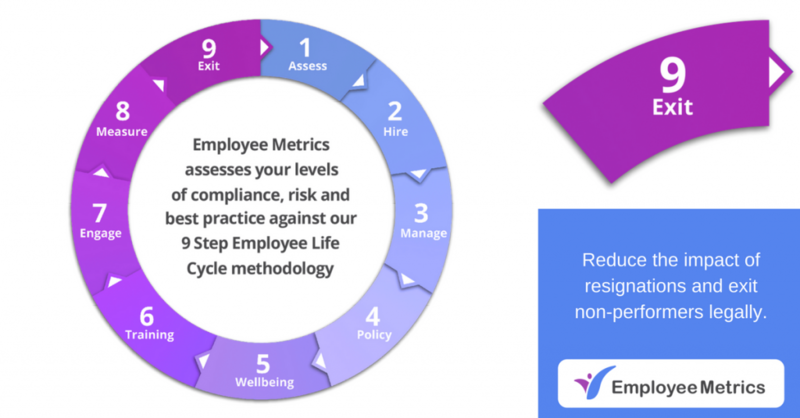 Employee Metrics can help organisations ensure all facets and legal requirements of exiting procedures are streamlined into operational practices. Once the process is set up, organisations won’t have to worry about legal compliance issues again. Employee Metrics diagnostic platform walks you through a detailed assessment, supported by an experienced HR Consultant. 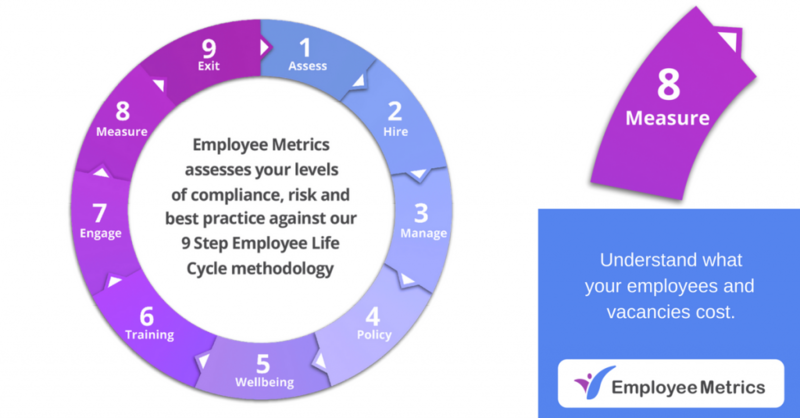 It generates a detailed report of your position across the 9 steps of the Employee Life Cycle. If you are new to our Employee Life Cycle series, click here to go back and begin at Step 7 Engage, or read on for Step 8 Measure. Every day, more and more organisations are facing challenging questions regarding the measurement, cost and effectiveness of their workforce. With a total of 92 million working days being lost through unexpected absences new practices and processes are required to address the cause and measure effective change. There are important reasons why organisations should measure the effectiveness of their workforce. Once we measure, we know the present state of the workforce and the actions needed to begin controlling and shaping better processes. We can then start to manage what is working, and what is not, to then maximise the investment of people and processes to help drive sustainable performance and productivity throughout the organisation. Having the framework to manage the ever-changing employee relationship is the first step to help measure employee turnover, workforce productivity and absenteeism. Having the ability to understand direct and indirect employee costs and what employees are costing the organisation, versus the cost of inaction, are critical efficiency drivers. The modern workforce has undergone a significant shift in values and expectations. The employee of just 5 years ago is very different than the employee of today. Employee Metrics helps improve future success and manage change through qualitative analysis of what needs to be measured throughout the employee and HR relationship. Step 8: Measure: Understand what your employees and vacancies cost. Step 9 Exit: Reduce the impact of resignations and exit non-performers legally. If you are new to our Employee Life Cycle series, click here to go back and begin at Step 1 Assess, or read on for Step 7 Engage. According to Gallup’s 142 country study on the State of the Global Workplace tracking, only 24% of employees in Australia are engaged – meaning they are involved in, enthusiastic about and innovating in their work and workplace. That means, unfortunately, 60% of Australian employees are “not engaged”, meaning they lack motivation and are less likely to invest discretionary effort in organisational goals or outcomes. An an additional 16% are “actively disengaged”, indicating they are unhappy and unproductive at work and liable to spread negativity to co-workers. Business leaders must raise the bar on employee engagement. The role of leadership is paramount in driving employee engagement. Leaders need to educate and motivate their workforce to ensure employees are personally committed. This means ensuring all employees understand what engagement is and what each person’s responsibility and role in creating and maintaining an engaged workplace is. Employee engagement is a headline issue throughout business and HR. Building a compelling and meaningful workplace environment is a complex process.That’s why the more successful organisations have some of the most stringent recruiting policies. The statistics are staggering and show just what an impact culture and engagement has; one study found applicants who were a cultural fit, would accept a 7% lower salary, whilst departments with good cultural alignment had 30% less turnover. It is important that the culture of an organisation be infused with meaning. Studies show that people who have a sense of purpose are more focused, creative, and resilient. A recent study by economists at the University of Warwick found that happiness led to a 12% spike in productivity, while unhappy workers, on average, proved to be 10% less productive. Employee Metrics can assess and evaluate the key dimensions of workplace engagement practices to lift culture, reward and recognition, leadership and communication throughout an organisation. Step 7 Engage: Foster a highly motivated and productive workforce. Employee Metrics diagnostic platform walks you through a detailed assessment, supported by an experienced HR Consultant. 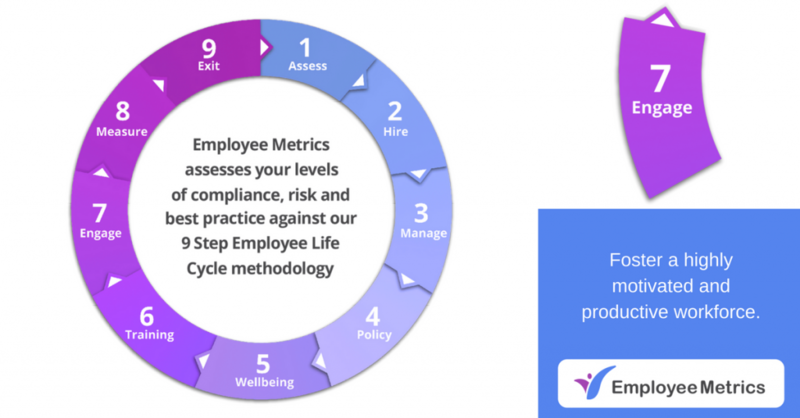 It generates a detailed report of your position across the 9 steps of the Employee Life Cycle. Step 8 Measure: Obtain an accurate view of your employee and vacancy costs.